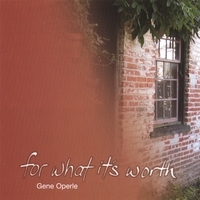 Gene Operle wrote all of the tunes on “For What It’s Worth”. The album melds country, folk, and soft-rock genres and each song chronologically serves as a mini-chapter in a man's journey through life. A portion of the proceeds from the sale of this CD benefited the "Uganda Cow Project" and local school band programs. Here's some comments from fans..... "I was blown away by that CD" "That was an awesome piece of work!" "Your music speaks from the heart and is beautiful" "If you had other albums out, I would head straight to the store!" "His ability to get people to be able to visualize a story through words is absolutely incredible!" "Got it yesterday and I've already listened to it about 5 times!" "Great vocals and instrumentation!" "The production quality is amazing!" "I want more!"